Did you know that yard work can help protect your property from wildfire? Take part in National Wildfire Community Preparedness Day on May 5. 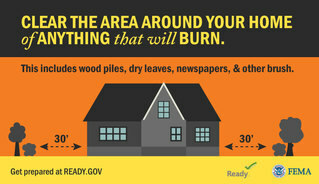 Clear your property of dried leaves, branches, and other items that may fuel a wildfire. Prune trees, so the lowest branches are 6 to 10 feet from the ground. Keep your lawn watered and maintained. If it is brown, cut it down to reduce fire intensity. Dry grass and shrubs are fuel for a wildfire. Do not let debris and lawn cuttings linger. Dispose of these items quickly to reduce fuel for a fire. Visit the U.S. Fire Administration’s Wildfire Safety page or download the How to Prepare for a Wildfire guide to learn more. Moorpark, CA: Sheriff Bill Ayub makes special visit to DART first aid booth on Sunday March 31, 2019 at the Persian New Year Celebration. 10,000 participants were expected at the annual Spring conclave. This year Arroyo Vista Community Parrk in Moorpark was the site and the Thousand Oaks DART team was deployed to provide first aid services throughput the event. Members conducted regular foot patrols to provide urgent service as needed and to keep an eye on safety hazards given the many barbecues in-use. DART is looking for new members to kick off our fiscal year 2020. If you are self-motivated, can work with a team, and eager to make a difference in our community, this is the role for YOU! If you are interested in joining, take a look at our New Member Training page and submit a candidate application! Thanks to the office of Assembly Member Jacqui Irwin, the City of Thousand Oaks and DART prepares the public for the inevitable. Three of our newest DART members deployed to City hall for this wonderful event and educated the public on disaster preparedness and basic household knowledge that is often overlooked such as how to turn off the gas, electricity and water to home. Demonstrations of how to create your own ‘go bag’ were held as well as literature distributed about what you can do to be a step ahead when things go wrong!